While it may seem like it’s only just begun, the spring season is coming to a close, and most Big Green teams get their final shot at Ivy League competition this week. On the diamond, the Big Green is in an ideal position, with opportunities to lock up postseason position for both baseball and softball this weekend. Men’s lacrosse and men’s tennis will also be in Hanover this weekend looking to grab one final victory while heavyweight crew hosts its only events of the spring. Thanks to a 10-game win streak, including a pair of four-game sweeps against Red Rolfe Divison rivals Yale and Brown Universities, the baseball team (16-19, 12-4 Ivy) has cruised to its eighth straight division title ahead of this weekend’s matchup with Harvard (18-20, 7-9 Ivy). In stark contrast to last year when the Big Green took home the division crown in a one-game playoff, this year, Dartmouth pulled ahead early and is now just jockeying for position with teams in the Lou Gehrig Division for the right to host the Ivy League Championship Series on the first weekend in May. Despite making the series in each of the past seven seasons, Dartmouth has not brought home a title since 2010 and hasn’t hosted the three-game playoff since 2009. Last weekend, the Big Green won a pair of tight games against Brown (9-26, 4-12 Ivy) in the Sunday doubleheader on a walk-off sacrifice fly from catcher Matt MacDowell ’15 and a fielder’s choice from designated hitter Joe Purritano ’16. Purritano has been one of the keys to the team’s offense this season, driving in a team-high 27 RBIs and slugging 0.472 on the year. The other cornerstone of the Big Green offensive production is leadoff hitter and shortstop Matt Parisi ’15, who leads the team with a .341 batting average on the season and was recently nominated for the Brooks Wallace Award as the best shortstop in the country, the only Ivy student nominated. Harvard is second in the Ivies in batting average and leads the league on the mound with 243 batters struck out, but has struggled with consistency, splitting each of its last two Ivy series 2-2. Barring a major disaster, this weekend should serve as a solid tune-up for the Big Green as the team strives for home field advantage in the Ivy Championships.PREDICTION: Dartmouth wins three games. Harvard wins one. The softball team (21-14. 14-2 Ivy) is also in a commanding position with a three-game lead on Harvard (21-19, 11-5 Ivy) in the North Division with only four regular season games left to play in the Big Green’s quest to repeat as Ivy League Champions. 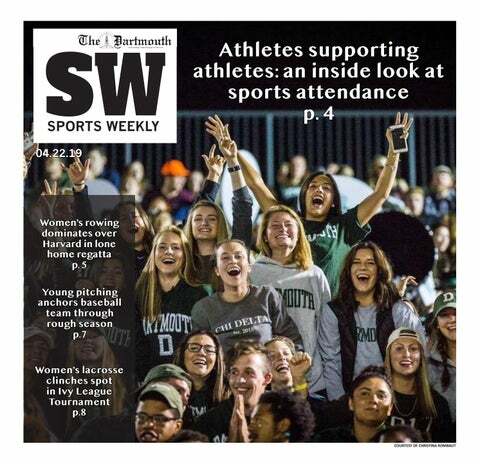 Dartmouth, led by the veterans Kristen Rumley ’15 — who tops the Ivy League in wins and ERA — and Katie McEachern ’16 — the league leader in both batting average and home runs — is looking to prove that last weekend’s 9-0 loss sandwiched between three victories was just a fluke. The Crimson will be fighting for their lives when they take the field on Saturday, hoping for a miracle behind senior Laura Ricciardone who is second in the league to Rumley with 11 wins on the season. Harvard’s high-powered offense leads the league in runs scored and RBI and is second only to Dartmouth in home runs. The Big Green also holds a better record than any team in the South Division by four games, which all but guarantees that the Ivy Championship Series will be played at Dartmouth Softball Park in two weeks. Despite Harvard struggling to keep their season alive, the Big Green is too deep to drop all four games and should finish the weekend looking toward another home matchup for the Ivy crown.PREDICTION: Dartmouth wins three games. Harvard wins one. In its final action of the season, the Ivy League’s second and third-ranked teams face off for bragging rights. Columbia University 14-5, 7-0 Ivy) has already won the League title with a perfect record, but the Big Green would love to finish on a high note and a five-match win streak. After dropping its first two league matches, Dartmouth (13-10, 4-2 Ivy) has stormed back to win four in a row and is ranked No. 46 in the country. Last weekend, the Big Green welcomed Yale University (11-11, 1-5 Ivy) to Hanover and came away with a 5-2 win, dropping the doubles point but taking 1-5 singles for the win.